Directors Forum 2018: Directors, Management & Shareholders in Dialogue brings together investors, directors and management to engage in open, off-the-record dialogue about today’s pressing governance issues. Speakers will put a spotlight on the escalating impact of “corporate culture” on business success. Gilead Sciences Proxy Voting Guide by James McRitchie. Graphic by Gilead. Gilead Sciences Proxy Voting Guide by James McRitchie. 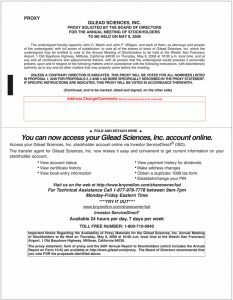 Gilead Sciences, Inc., a research-based biopharmaceutical company, discovers, develops, and commercializes medicines in the areas of unmet medical needs in Europe, North America, Asia, South America, Africa, Australia, India, and the Middle East. 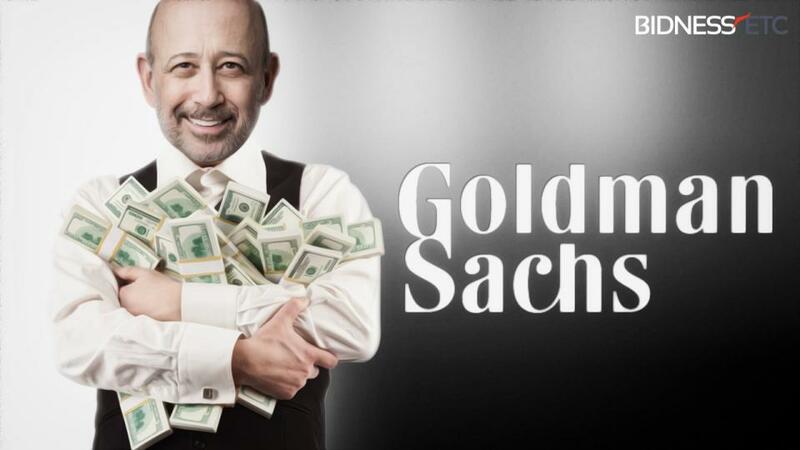 Gilead $GLD is one of the stocks in my portfolio. ProxyDemocracy.org had collected the votes of four fund families when I checked and voted. The annual meeting is May 10, 2017, so vote NOW! If you have already voted, you can change your vote online until May 9. 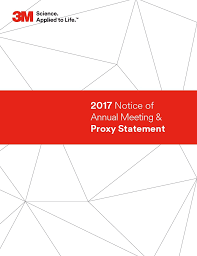 3M Proxy Voting Guide provided by Corporate Governance (CorpGov.net). 3M (MMM), 3M Company operates as a diversified technology company worldwide and is one of the stocks in my portfolio. ProxyDemocracy.org had collected the votes of three fund families when I checked and voted. Their annual meeting is coming up on May 9, 2017. This is our Bristol-Myers Squibb Proxy Voting Guide for 2017. 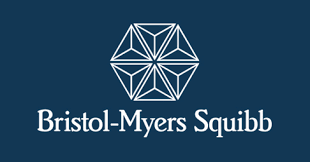 Bristol-Myers Squibb Company (BMY) discovers, develops, licenses, manufactures, markets, and distributes biopharmaceutical products worldwide. Bristol-Myers Squibb is one of the stocks in my portfolio. ProxyDemocracy.org had collected the votes of two fund families when I checked and voted. 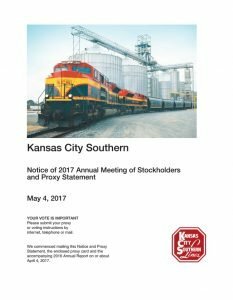 Their annual meeting is coming up on May 2, 2017. Kelloggs manufactures and markets ready-to-eat cereal and convenience foods in the United States and internationally. The Kellogg Company is one of the stocks in my portfolio. 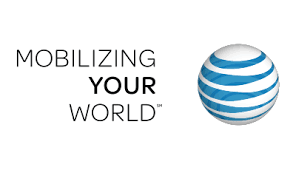 AT&T Inc. (T) provides telecommunications and digital entertainment services. 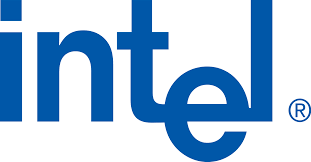 The company operates through four segments: Business Solutions, Entertainment Group, Consumer Mobility, and International. It is one of the stocks in my portfolio. ProxyDemocracy.org had collected the votes of three fund families when I checked and voted. Their annual meeting is coming up on 4/27/2017. Sorry for the late post. NCR Corporation provides omni-channel technology solutions that enable businesses connect, interact, and transact with their customers worldwide. NCR is one of the stocks in my portfolio. ProxyDemocracy.org had collected the votes of only one fund family when I checked and voted. Their annual meeting is coming up on Wednesday, April 26, 2017. Apple Inc. (NASD:AAPL) designs, manufactures, and markets mobile communication and media devices, personal computers, and portable digital music players to consumers, small and mid-sized businesses, and education, enterprise, and government customers worldwide. AAPL is one of the stocks in my portfolio. ProxyDemocracy.org had collected the votes of two funds when I checked and voted. Their annual meeting is coming up on February 28th, 2017. 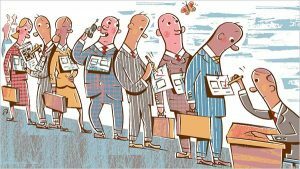 I continue my review of The Handbook of Board Governance: A Co mprehensive Guide for Public, Private, and Not-for-Profit Board Member. 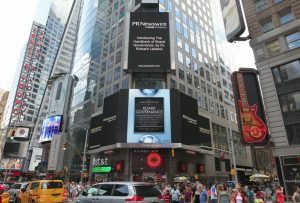 With the current post, I provide comments on Part 5 of the book, The Unsolved Governance Problem: Performance Measurement and Executive Pay. 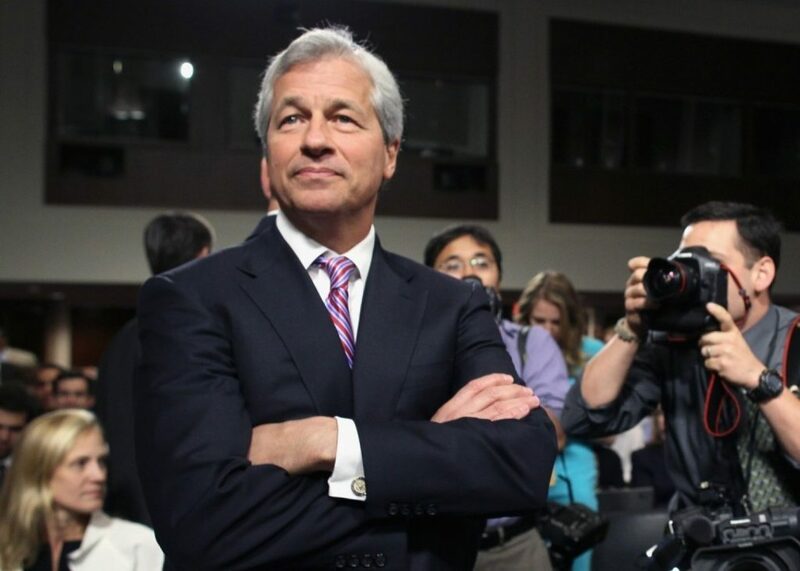 Talk to any of your acquaintances outside the corporate governance industrial complex and they will all have an opinion regarding CEO pay. This is a part of the book everyone can relate to. 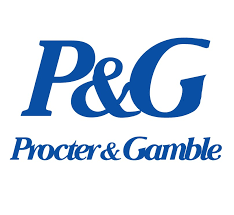 Procter & Gamble Co (NYSE:PG) provides consumer packaged goods and is one of the stocks in my portfolio. Their next annual meeting is October 13, 2015. ProxyDemocracy.org had collected the votes of four funds when I checked and voted. I voted with the Board’s recommendations 56% of the time. View Proxy Statement. H & R Block Inc (NYSE:HRB) provides tax preparation and banking services and is one of the stocks in my portfolio. 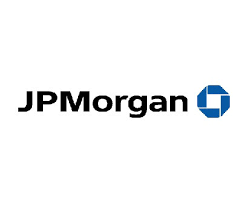 Their next annual meeting is September 10, 2015. ProxyDemocracy.org had collected the votes of one fund when I checked and voted. I voted with the Board’s recommendations 67% of the time. View Proxy Statement. 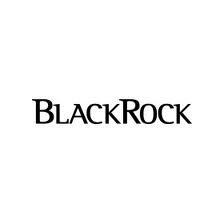 BlackRock, Inc. (NYSE:BLK), one of the stocks in my portfolio, provides investment management, risk management and advisory services for institutional and retail clients worldwide. Their annual meeting is coming up on 5/28/2015. ProxyDemocracy.org had the votes of one fund when I checked on 5/19/2015. I voted with Board recommendations 65% of the time. Illumina, Inc. (NASD:ILMN), one of the stocks in my portfolio, is a developer and manufacturer of life science tools and integrated systems for the analysis of genetic variation and function. Their annual meeting is coming up on 5/27/2015. ProxyDemocracy.org had the votes of two funds when I checked on 5/18/2015. I voted with Board recommendations 37% of the time. 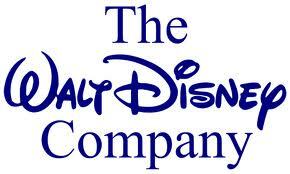 The Walt Disney Company $DIS, which operates as a worldwide entertainment company, is one of the stocks in my portfolio. Their annual meeting is coming up on 3/12/2014. ProxyDemocracy.org had the votes of four funds when I checked and voted on 3/8/2015. I voted with management 79% of the time and assigned them a proxy score of 79.